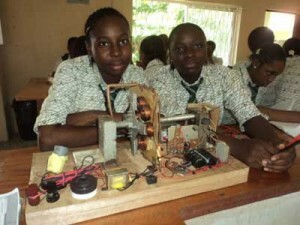 Two students of Doregos Private Academy, Lagos, Olajumoke Adebayo and Eniola Adewale has invented a fueless power generator. The invention was showcased at the Pan-African Women Inventors & Innovators Network Symposium, Expo & Awards at the ECOWAS Commission in Abuja. The event titled Innovative Women with Innovative Solutions for Africa was witnessed by the minister of Information and Communication, Prof. Dora Akunyili, and Mrs Josephine Anenih., minister for Women Affairs, It was indeed a commemdation galore for the students as other youths were advised to emulate them. The students both in SS3 and members of the Junior Engineers, Technicians & Scientists (JETS Club) said the idea was born out of a need to minimize the cost spent of the usage of fuel generators as an average amount of N10, 000 is spent on fuel weekly adding that their invention does not emit any toxic and poses no threat to human health. According to them, the idea was conceived through the JETS club to which they belonged as coordinators. “We used magnetic flux to generate electricity which the conventional magnet cannot. It consists of a shaf fixed with eight neodymium magnets which rotates when an initial current is passed through the field coils. The electricity is then passed from the copper coil to a step-up transformer which steps up the power voltage from 32 volts to 200 volts to power the output of the generator”. They said. The young stars noted that JETS club afforded them a vantage avenue to think, analyze and work on scientific research before embarking on the project based on their scientific knowledge that a generator can still exist without using fuel. They stated that it is possible to produce cheaper and more dependable source of electricity for both domestic and industrial use. The invention the students admitted was not an easy scale through as they had to make several presentations and seminars on the project to the audience comprising their teachers and the school authority before they were finally selected to defend the significance of their project. The materials used for the invention according to them are a locally fabricated step up transformer, capacitors with total capacity 400,000 uf, neodymium magnets, copper wires transistors battery, oscillators, bulbs and several other materials. This type of generator have been done/invented already. Just do a search on Google. Sorry.